Home → Our Services → Why Hire a Professional Electrician? Whether building a new home or business, or renovating an existing one, there are many areas where you can save money. But when it comes to the safety of the people you love or jeopardizing your investment, do you really want to cut costs? There are plenty of non-licensed trades people who will work for cash. While you may save money on taxes etc., you are also left unprotected. Unfortunately, you will have no guarantees on either the quality of the work or the materials that are used. Hiring a professional, licensed electrician gives you the confidence of knowing you have a business that stands behind its work and its workers. Oosterhof Electric Services Ltd. gives you that peace of mind. We provide the assurance of excellent workmanship and quality materials. The work site at your home will be cleaner than when we started, and our friendly, professional employees are a pleasure to have in your home or business. How should you choose an electrical contractor? We believe “word of mouth” is one of the best advertisements, so we suggest you talk to your friends and associates before deciding which professional to hire. 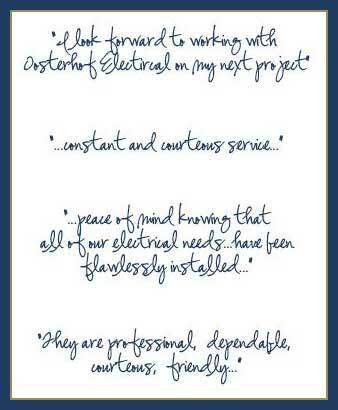 Oosterhof Electrical Services Ltd. has been pleased to serve many people since 1991. We are confident in the quality of our work – so are our customers. It was comfortable to have Oosterhof Electrical in our home. In my opinion, the electrical work that they did was of high quality. Everything works and meets my requirements for function and appearance. Oosterhof Electrical Services Ltd. maintained constant and courteous service through construction of a challenging custom home. They took on the difficult lighting and electrical challenges of a timber frame home with ease. Their communication with client and contractor was excellent. I look forward to working with Oosterhof Electrical on my next project.